What else is there to do on a cold wet Saturday... other than work? 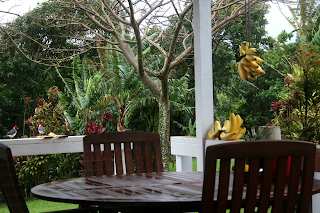 (which we did very little of today) Why camp out in the living room and watch a parade of birds feed on our offering of fresh bananas of course. 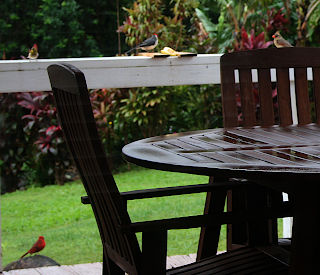 The cardinals have been absent for a few months and have reappeared over the past few weeks. It's funny to sit and watch one species eat away obviously in order of dominance, then to watch what happens when a totally different species shows up. It's quite civilized actually... they wait patiently in line for their turn and the only ruffling of feathers I witnessed was between the North American Male Cardinal and a Sparrow. 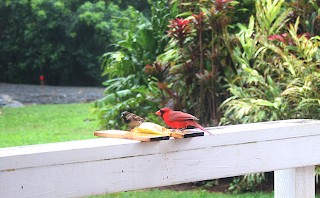 At one point there were 2 Brazilian Cardinals, 2 North American Cardinals and 3 Japanese White Eyes all vying for a coveted spot close enough to get a nibble. We find ourselves making up fake conversations between them... you can only imagine. 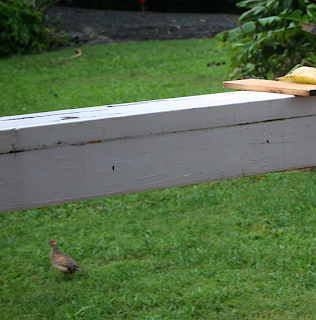 We placed 2 small pieces of wood on either side to keep the banana from being blown off. Today we were paid visits Brazilian Cardinals, North American Cardinals, Japanese White Eyes, Francolins, Myna's and Sparrows. 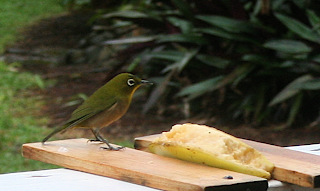 Note the Japanese White Eye on the bananas. 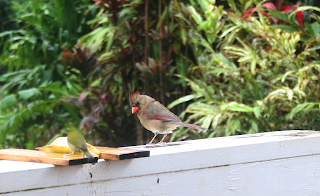 North American Female Cardinal and Japanese White Eye. "Uh, excuse me, are you almost finished? I've been waiting here for minutes." Those are prop birds you got at the craft store! 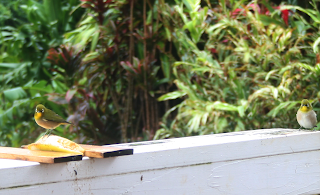 Are there big parrots and things like that on Maui? Or did I just imagine that from TV? You're right. We've been had. No, we do not have parrots. Well, there are about 40 green parrots that are escapes... the Invasive Species Committee is out to get them. Lots of native Honey Creepers... but we have not encountered any of those.Very elusive. This is totally cool! They look computer generated. Wow and Wild! 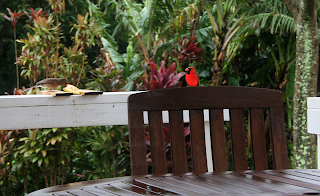 What a red cardinal that is. Vivid. Wonderful! More amazing even than the Hawaiian flowers! 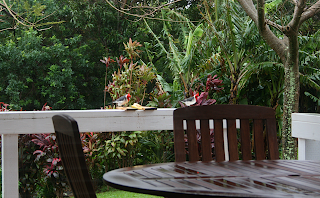 When we visited we were stunned at the variety of birds. Even the Hawaiian chicken was richly colored. 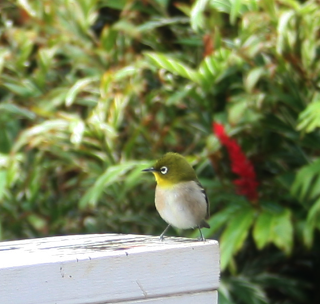 I think an artist could sketch ANYTHING and it would turn out to be a real bird or flower in Hawaii! Our house finches, mourning doves and Towees come in droves for seed, seed, and more seed! They're taxing our finances!